Merguez is like the magic word in our house. (See our visit to Root for another example of this obsession.) This news perked up an otherwise pretty typically crappy Monday. We'd planned anyway to go to the Avenue Pub to collect another Duvel glass and we enjoyed a couple nice beers there (I had, in addition to a Duvel, an Anchor Summer Ale and Brooklyn Irish Stout, and Tom had 2 Duvels and a High and Mighty Purity of Essence) and a friend whose company we greatly enjoy stopped by as well. The evening was looking up! After we left the Pub, we went to Coquette in search of Merguez. We were pleasantly surprised to see that the dining room was full on a Monday night, and were seated outside. It was a lovely night- just cool enough so that the bugs weren't out, but not cold. Very enjoyable evening to eat al fresco. We ordered drinks: I had a cocktail, of course- I love their cocktail menu. I ordered was the "Creaky Door" that had bourbon, strawberry shrub, and Angustura bitters. Served over ice in an old fashioned glass, it was really excellent-simply constructed yet complexly flavored. The bourbon and the fruitiness were beautifully married by the acidity of the shrub, and although the taste of strawberries was definitely present, there was no sweetness, only the flavor of the fruit itself. I assume they make their own shrub- I know I've seen jars of infusions behind their bar since I started going there. Tom availed himself of one of the very nice bottles of beer they had listed - Gulden Draak, a dark Belgian ale. The bar manager, Jeff, stopped by to see how our drinks were and I, my tongue possibly loosened by delicious beer, booze and general joy, talked a lot with him about how much I enjoyed my cocktail, and discussed the trend of using shrub in cocktails, which we all were big fans of. I mentioned that we had heard about the lamb special on Twitter that day, and asked if he did the social media stuff for Coquette. He said he didn't, and confessed that he actually did not know who did that stuff. A voice came from a couple tables over, "oh, that's me!" And it was Chef Michael Stoltzfus, chilling with his laptop waiting to have a manager's meeting with his colleagues. Awesome! In this town, I get more excited meeting the chefs of the great restaurants than any of the movie stars or whatnot that hang out here shooting movies. We chatted a bit about merguez, their new menu, their source for ramps... 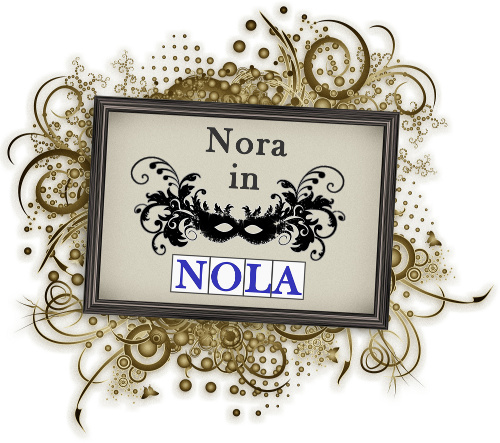 I got teasingly called out for not mentioning them in my interview with the Times-Picayune as a restaurant that features and respects beer - I told them it's because I'm always dazzled by their cocktail menu. That was totally my bad, which I hope to rectify in the near future. The bottle list at Coquette is small but pretty stellar- in addition to the Draak, we also ordered a bottle of the Hitachino Nest 3 Days, which is a beer that was left to mash for 3 days longer than it should have been due to evacuation during the 2011 earthquake in Japan. 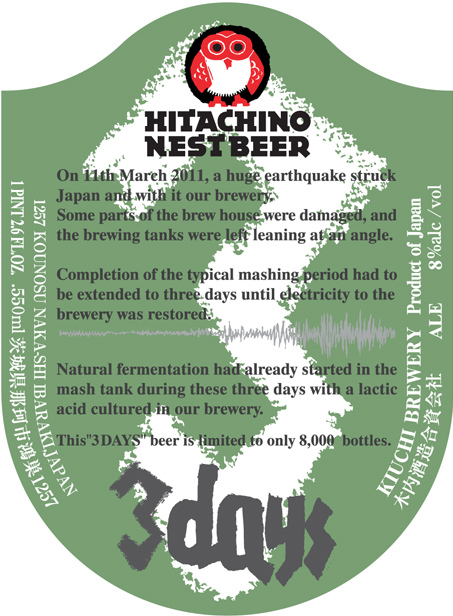 On 11 March 2011, a huge earthquake struck Japan and with it our brewery. Some parts of the brewhouse were damaged, and the brewing tanks were left leaning at an angle. Completion of the typical mashing period had to be extended to three days until electricity to the brewery was restored.Natural fermentation had already started in the mash tun during these 3 days with lactic acid cultured in our brewery. This “3 Days” beer is limited to only 8,000 bottles. This is a very special beer that I'd been wanting to try and I could tell from the reactions from both the bar manager and the chef, that it was a good choice. We asked that it be brought out to drink with our entrees. We decided to skip starters so we could be sure that dessert would be possible. Tom had the Two Run lamb loin and merguez with kohlrabi, Brussels sprouts and harissa and I had the duck breast that also had duck confit and was delicious. Tom declared it the best merguez he's had since moving to the States. Chef Stoltzfus stopped by to see how we enjoyed it, and after we effusively told him how awesome it was (as well as my dish and the 3 Days), he dropped a little package with two merguez sausages for us to bring home. Which was just so thoughtful, and just added to the greatness of the night. It's fun to kind of bond with someone who loves food like that. I was sincerely honored and flattered. Then, after we ordered dessert - Tom ordered the old fashioned donut with huckleberries, oatmeal crunch, and sour cream ice cream, and I got the kaffir lime panna cotta that I'd admired the last time I was at Coquette - Jeff the beer man bar manager stopped by with a present! He let us have some of his stash of Dogfish Head Midas Touch, a beer that is not distributed here, and which paired beautifully with dessert. (I would also like to note that the funkiness of the 3 Days went very well with the game flavor of both the duck and the lamb.) Again, we were totally in awe at the generosity shown at Coquette, just talking and enjoying food and beer with people who love food and beer! How is this not a perfect night? 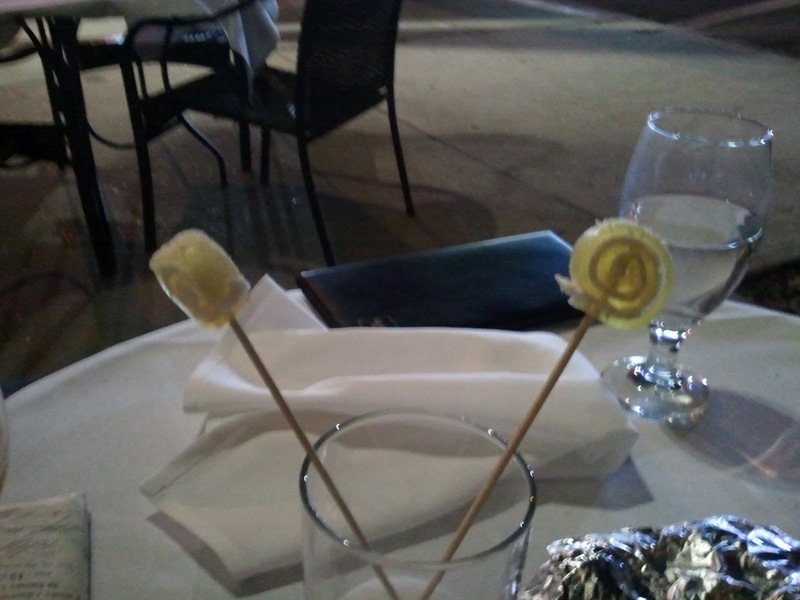 After we happily finished our dessert, a little post meal mignardises came out for one last delight: I think they called it an ambrosia pop? Whatever it was called, it was delicious, and a perfect end to a perfect meal on a perfect night in New Orleans- full of delicious beer (and an equally yummy cocktail), exciting food, great conversation with interesting, thoughtful, generous people whose work I deeply respect, gorgeous night, the person I love most in the world... It just doesn't get better than that.